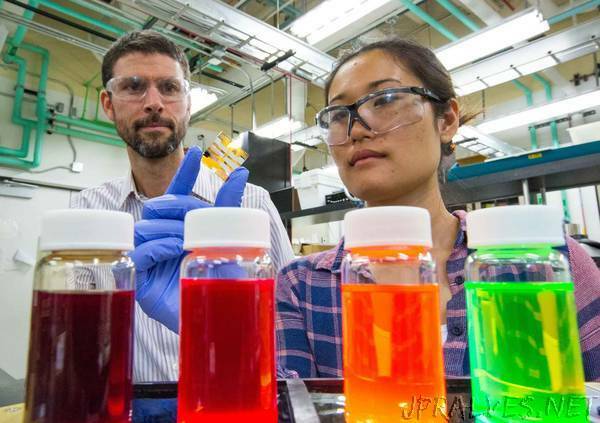 “Researchers at the U.S. Department of Energy’s (DOE) National Renewable Energy Laboratory (NREL) established a new world efficiency record for quantum dot solar cells, at 13.4 percent. “This voltage, coupled with the material’s bandgap, makes them an ideal candidate for the top layer in a multijunction solar cell,” said Joseph Luther, a senior scientist and project leader in the Chemical Materials and Nanoscience team at NREL. The top cell must be highly efficient but transparent at longer wavelengths to allow that portion of sunlight to reach lower layers. Tandem cells can deliver a higher efficiency than conventional silicon solar panels that dominate today’s solar market. The multijunction approach is often used for space applications where high efficiency is more critical than the cost to make a solar module. The quantum dot perovskite materials developed by Luther and the NREL/University of Washington team could be paired with cheap thin-film perovskite materials to achieve similar high efficiency as demonstrated for space solar cells, but built at even lower costs than silicon technology—making them an ideal technology for both terrestrial and space applications.